frame and real UV protected glass. The back is mirrored so you can see the entire doll. WE CAN MAKE ANY CUSTOM SIZE YOU NEED. JUST ASK! Molded acrylic display case for a single barbie size doll on a stand. Comes with an additional mirror panel so you can use this display case. with either a clear or mirrored back. It is a high quality case at a more affordable price. This case is also stackable. The beveled edges also add style. Interior case dimensions are 13 x 5 x 5 1/2. 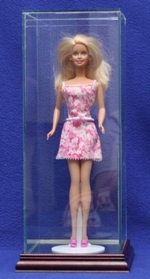 Molded acrylic display case for a single barbie size doll in it's box. with either a clear or mirrored back. It is a high quality case at a more affordable price. Molded acrylic display case for a single barbie size doll with full dress and headwear. TComes with an additional mirror panel so you can use this display case. Interior case dimensions are 15 5/8 x 7 1/8 x 6 3/8. 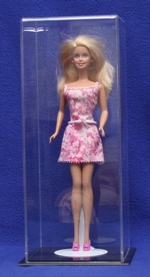 Molded acrylic display case for a single barbie size doll with a wider dress. nameplate. Additional nameplates are available. We do custom sizes, Just Ask!! PERFECT FOR MOST BARBIE SIZE DOLLS: 5-1/2 inch diameter x 13 inches high display dome made of the finest quality glass, with your choice of custom bases. Select base from the drop down menu. Price includes 1 free nameplate. Additional nameplates are available.